Undoubtedly, BenQ is among the top projector manufacturers in the US. People love their products and most of them are highly rated on Amazon. I used some cheaper projectors before but they all were disappointments. 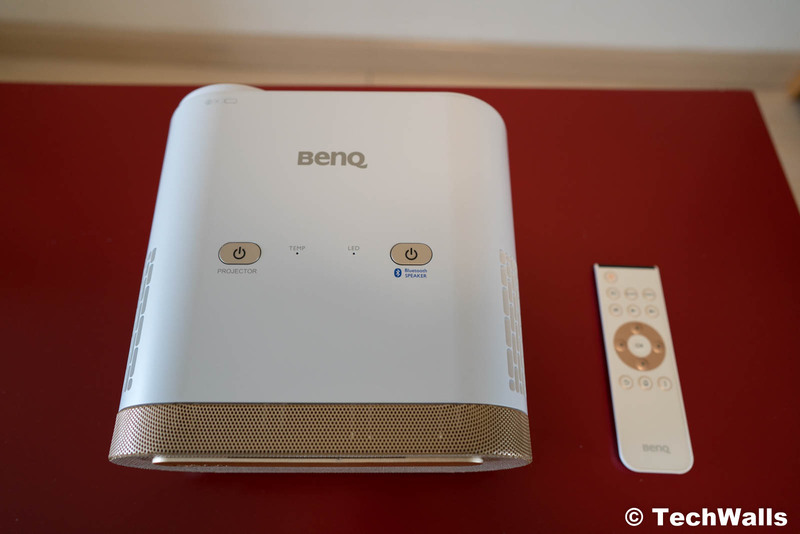 The BenQ i500 has a lot of promising features and I really hoped it could become an important device in my home entertainment system. Keep reading my review to learn more about the product and see if it’s worth the price tag of $799. The BenQ i500 actually has a very cool and modern design. The projector itself is quite compact and I really love its minimal design. It is not only suitable for home use but you can also carry it outside when you need a portable projector. I really love that both the lens on the front and connectivity ports on the back have magnetic covers. When you open the lens, you can place that cover to the ring on the right so it won’t be lost. BenQ doesn’t place a whole bunch of buttons on top of the projector. Here you can find just 2 buttons, including the power and Bluetooth button. On the left side, we have a focus ring and on the front, there is just a button to adjust the projector’s angle. Notably, the projector doubles as a Bluetooth speaker, you can totally play music from your mobile device with the speaker. Unfortunately, you can’t use it as a Bluetooth transmitter, so you can’t connect it to your existing Bluetooth speaker or headphones. 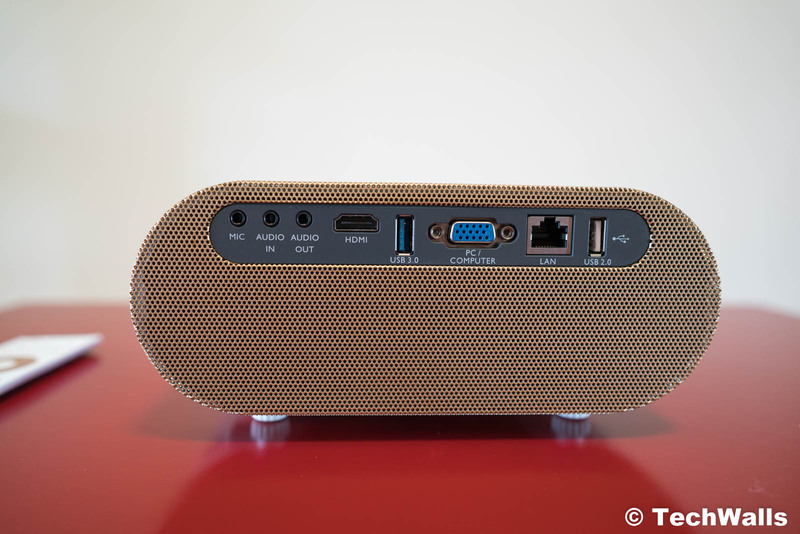 In terms of audio performance of the built-in speaker, it is better than most other projectors’ but it sounds worse than a $50 Bluetooth speaker. Therefore, don’t even consider removing an external speaker system. Since almost all buttons are gone, you will need to use the remote control to set up and control the projector. On the back, there are some familiar ports like Mic, Audio In/Out, HDMI 1.4/MHL, USB 3.0/2.0, PC, and LAN port. 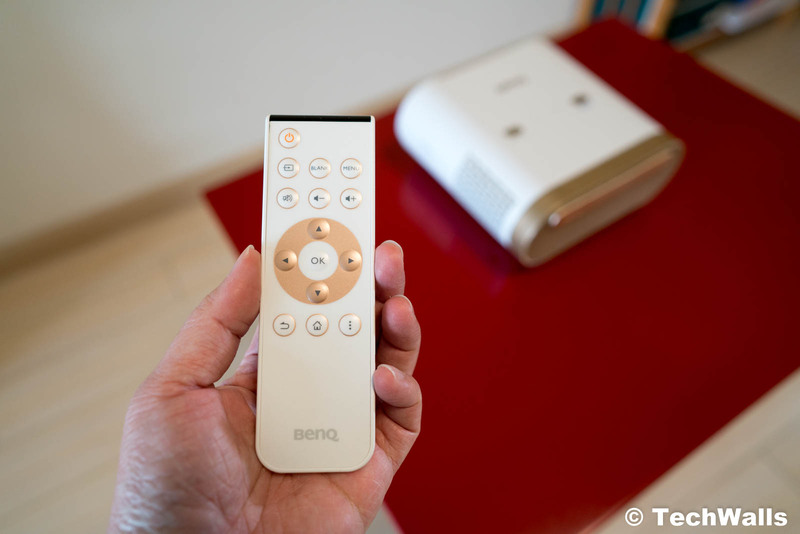 The two best features of the BenQ i500 are short-throw projection and a built-in Android OS. However, just one of them works like promised. The projector has a throw ratio of 0.6:1, that means you can place the projector pretty close to the screen/wall. Specifically, it can project a 77-inch image at a distance of just about 3 feet. On the other side, the Android OS on this projector is just terrible. I tried to install apps and use video-streaming apps, but the performance is so sluggish that I stopped trying after 20 minutes. Even the Youtube app doesn’t run properly and has a lot of bugs. Moreover, this is a modified Android version with a lot of bloatware, so I’m not confident to provide my usernames and passwords. Overall, you should avoid using the built-in OS at all cost and connect it to external devices instead. I tried some BenQ displays and projectors before and was quite satisfied with the image quality. I expected the BenQ i500 could deliver the same thing, unfortunately, it disappoints me once again. You can check out this video to see the lens quality. Despite having a premium price tag, the projector has pretty low specs. It has a maximum brightness of just 500 lumens the native resolution of WXGA (1280 x 800) pixels. Therefore, it is unusable under normal lighting conditions, you will have to turn off all the lights to see the images clearly. 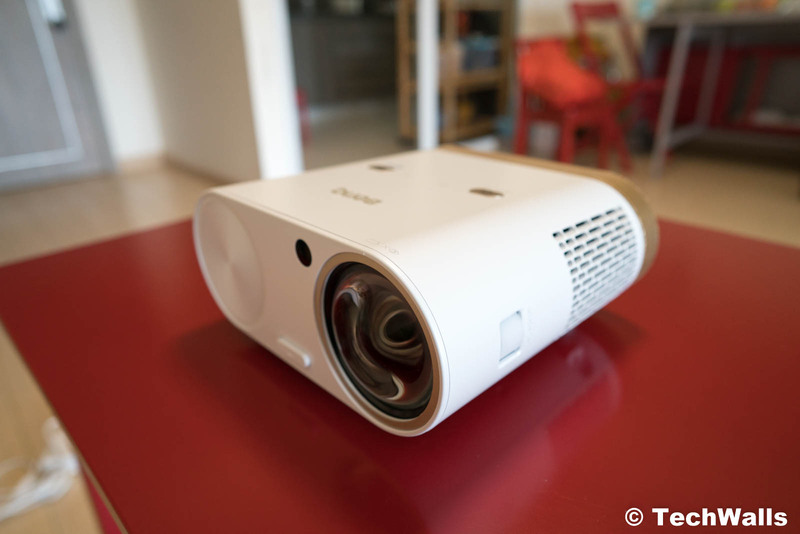 In terms of clarity and color accuracy, the projector has the same performance as some cheap Chinese projectors. The image is grainy and pixelated. I can’t read text from websites even when I look at a very close distance. It is also not a good idea when watching movies with this BenQ because the projected image loses a lot of details and I couldn’t see anything during dark scenes. The only advantage is that the corners are not blurry when the projected screen is large. Overall, the BenQ i500 is totally an overpriced product. It has a price of a high-end product but the performance of a low-end. I see that the product is on sale for $500 but I won’t recommend it until you can grab it at around $300. An overpriced projector with a lot of downsides. Lovely projector. I want to buy this for my tutorial class purposes. Thanks, for sharing an informative post. Selecting Factory Reset in the OSD runs the risk of the projector locking up, and if it does it has to be sent to BenQ to reset it.